Academic aptitude – Verbal section includes 30 vocabulary items; math section includes 30 questions related to aptitude, concepts and speed of calculations (around 8th grade level); nonverbal section includes 30 questions on understanding associations (capacity to mentally move things around), and capacity for handling concrete materials with visualization (understanding associations and differences). Spelling – Gauges candidate’s fundamental capacity to spell. Reading comprehension – Measures candidate’s capacity to comprehend what is read, including facts and intent of the author. Information in the natural sciences – Gauges candidate’s knowledge of the basics of biology, chemistry, health, safety and so forth. Judgment and comprehension on practical nursing situations – This assessment has to do with how a candidate might handle episodes in the workplace as a nurse. Vocational adjustment index – This assessment gauges a candidate personally in traits and actions as to whether he or she would be a good fit as a potential candidate or practitioner. The test outcome is given as a percentile rank. For example, if a candidate gets 60%, that means that the candidate did better than 60% of other people in a particular comparison group. This group is made up of other people who are submitting applications for practical or vocational academic nursing programs in the United States and Canada. For each subtest, candidates will get a rating that ranges from very low to superior. This test is not the only determinant of whether or not candidates are accepted into their academic program of choice, but it may be used as one of the factors when making that decision. 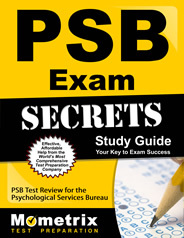 Ace the PSB-RN test using our PSB-RN exam study guide with practice questions. 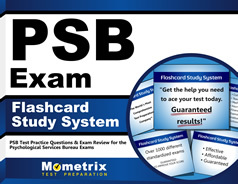 Quickly Solve Difficult PSB-RN Test Questions with the PSB-RN Flashcard Study System.